Some of those warm platitudes can fall flat when taken literally. A rolling stone gathers no moss. A stitch in time saves nine. But when you’re in space with a Xenomorph in your gut, the last thing you wanna hear is “It’s what’s inside that counts.” It won’t be long until what’s inside will be outside and threatening your friends’ lives. Just because you’re already dead. If you find yourself in the dead of space and the only company you’re keeping is the rumbling in your tummy, perhaps it’s best to just… stay away from any other life form for the time being. 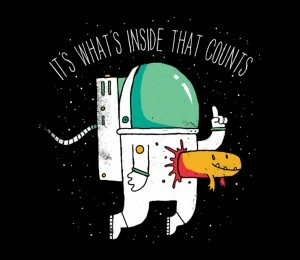 They might think you’re being rude, but… it’s what’s inside that counts.